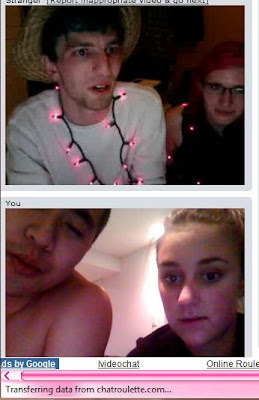 So I've been on this new site called Chat Roulette a couple times, but I always blocked my screen and shuffled through the people to see what I could find. As our first "stranger," I thought they were going to be pretty lame at first. Then they started asking to see some goodies. When I told my CBFF to show his, they insisted on mine. Next! This guy was absolutely my favorite of the night! Straight from JAPAN! He kept saying "konnichiwa" and putting his hands together and bowing. It was amazing. Then I got confused on what he was trying to say... Next! 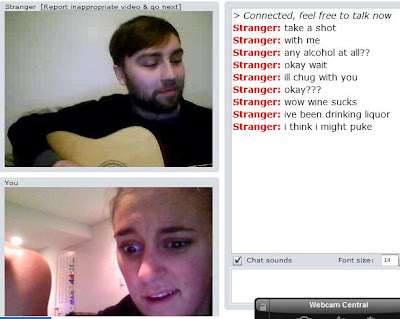 This guy played a song for me! He also chugged a box of Franzia red wine on demand. I think we're online BFF soulmates.... Until he mentioned puking. Next! I was officially scared for my life. Next! He looked like he needed some friends. I tried to be his friend. I even tried to fist pump with him. He laughed at me. Next! I let CBFF take over for a bit, and he finds a couple mooning him. I wonder who he's smiling at. [JK, dear.] That's all they did, though... Next! As soon as we found him, he starting hitting his chest and acting like a gorilla. I'm a big fan of monkeys, but wow. Too much. Next! As much as I love Christmas lights as jewelry, it's not Christmas anymore, homie. Next! Now, our night didn't stop there. We found more people, and like I said, the X-rated nonsense. Lots of people diddling, sexing, etc. Since I know my readers love that kind of stuff, I'm posting it, but you have to click here! I can't wait to do this again! It was fun, I'm not going to lie! My only recommendation: Make sure you're hammered.